Pope Francis was in Rio de Janeiro for the week to celebrate World Youth Day, and on Sunday morning he attracted a huge crowd of three million for Mass. While this Pope is certainly popular in Brazil, he may gain some (hesitant) popularity with the LGBT community now as well. 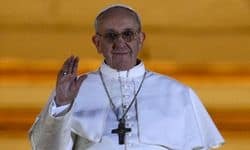 During the interview, the Pope also reported that several allegations of gay trysts with high ranking Vatican officials had been investigated and had no truth to them. He reportedly delivered this news, and his other comments, light-heartedly; according to the AP, "He was funny and candid during a news conference that lasted almost an hour and a half. He didn't dodge a single question…"
The Pope did still refer to homosexuality as a sin, but his reported good will came through. …when someone sins and confesses, he said, God not only forgives but forgets. Could the Catholic Church be taking a progressive turn? Was the Pope simply having a good day? His comments are at least a small step in a positive direction.